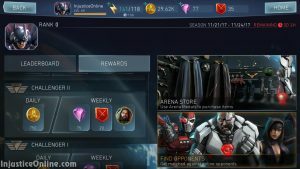 The next Arena Season for Injustice 2 Mobile is here. 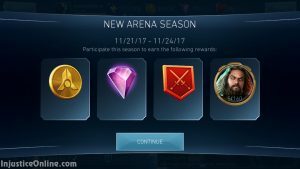 It gives you the chance to compete for gold Justice League Aquaman character shards. 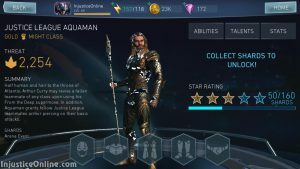 Jason Momoa’s Aquaman joins the hero roster of Injustice 2 Mobile as one of the fourth Justice League Heroes! Justice League Aquaman acts as a powerful defender for your team. Aquaman can revive any one fallen teammate back into battle again, activated on his supermove! He also boosts his Justice League teammates by giving them Armor Piercing on all basic and directional attacks. Half human and heir to the throne of Atlantis, Arthur Curry may revive a fallen teammate of any class upon using his From the Deep supermove. In addition, Aquaman grants fellow Justice League teammates armor piercing on their basic attacks. Justice League Aquaman is based on Jason Momoa’s Aquaman from the Justice League movie. Aquaman’s Supermove revives one fallen teammate with 15% health. 60% chance to Armor pierce for Justice League teammates on Basic, Tag, Jump, Rush, Ranged and Crouch attacks. As with every other reward and challenge you can expect the Justice League Aquaman season to show up every once in while so if you have missed it so far you will definitely get another chance.